A larger brain brings better cognitive performance. And so it seems only logical that a larger brain would offer a higher survival potential. In the course of evolution, large brains should therefore win out over smaller ones. Previous tests of this hypothesis had relied on comparison studies looking at the intelligence and survival potential of species with large brains versus species with smaller brains. And species with larger brains do appear to have an advantage. But such studies are unable to show a causal relationship. Alexander Kotrschal, Sarah Zala, Séverine Büchel and Dustin Penn from the Konrad Lorenz Institute of Ethology at the Vetmeduni Vienna studied fish to answer why investing in a larger brain might provide an evolutionary advantage to compensate for the fact that brain mass is very expensive to develop and maintain. Guppies are a species of freshwater aquarium fish whose natural range is in the Caribbean region. Kotrschal and his colleagues previously conducted an artificial selection experiment and successfully generated large- and small-brained guppies. In this study, they aimed to test whether brain size influences survival. Therefore, they released 4,800 guppies from these selection lines into large semi-natural streams, which also contained a natural predator, the pike cichlid. About half a year later, significantly more guppies with large brains had survived. The researchers suggest that large-brained fish have an advantage that allows them to better evade predation. "We have provided the first experimental proof that a large brain offers an evolutionary advantage," explains first author Kotrschal, who has since moved on to Stockholm University. Large-brained females, whose brains were about 12 percent larger than that of the small-brained females, evaded their predators more often and so had a higher rate of survival. Larger brains did not provide any survival benefit for males. 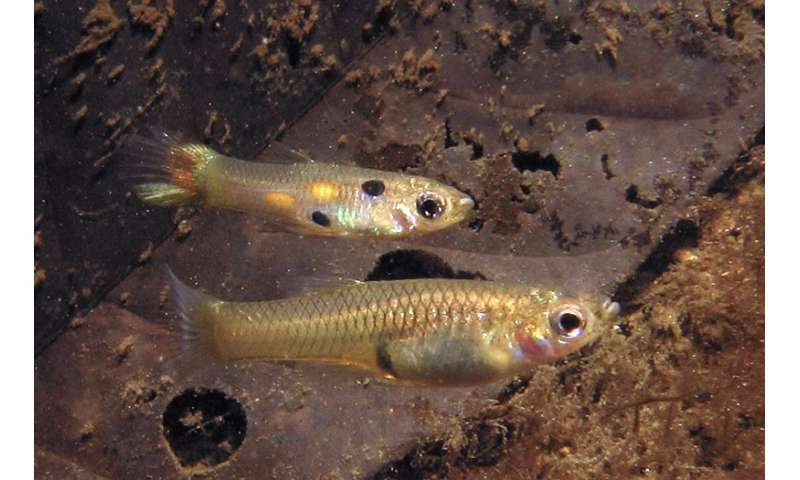 Ethologist Sarah Zala explains: "Male guppies are more colourful and more conspicuous than females and are therefore more easily caught by a predator. A larger brain does not appear to compensate this disadvantage." "Our findings support the hypothesis that large brains provide a survival benefit under predation pressure," says co-author Dustin Penn. The first results also suggest that groups of fish with large or small brains behave differently in the presence of the predatory cichlid. This behaviour merits further study. The researchers also want to know whether surviving fish produce more offspring. Genetic analysis should help provide clarity in this regard. Well, maybe there is another reason. Shrews ,the tiniest animal, and hummingbirds, the tiniest bird, have the largest brain for their size. Now why is that? They need the brain for orientation and food searching. They have no predators. It is possible big brains were the accidental beneficiary of a reduced stress environment. Less energy goes into coping with stress, radiation, etc., can then be redirected to the brain. An environment that was harsh and punitive would see on the fittest survive, then after the environment stabilized the energy going to cope with the stress would be free to be redirected.